This morning I woke up somewhere in Southern Austria. 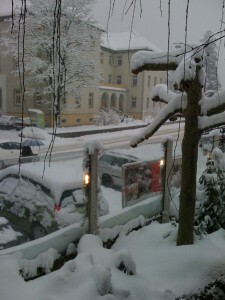 When I looked outside my window, I found a very heavy snowfall. My local colleagues tell me that we received somewhere between 50 and 60cm of snow. That is between 10 and 20ft, based on what I can see. Four weeks ago, I developed a rash (no, not that kind). My dermatologist (www.webmd.com) concluded it was a result of being exposed to extreme dry and cold conditions. In fewer words, I was allergic to Colorado. So, I moved from Colorado Springs back to Austin. Despite growing up in Northwest Indiana, which received significant amounts of snow fall and ridiculous below freezing temperatures, I am very warm blooded. After moving just 2 or 3 weeks ago and becoming acclimated to warm weather again, I found myself headed to Europe on a business trip. This is my third extended visit to Europe. The previous two were in November and Januarys, respectively. Eventually I will visit Europe when I don’t need 9 layers of clothing. After flying 5000 miles (or 8050 Kilometers), I landed in Vienna (Wien) to find it was 1 or 2 degrees above freezing, and starting to snow. The only thing open at 9am on Sunday, near my not-ready hotel room, was a McDonalds. My first full work day felt like two days, mostly because I took an 8 hour mid day nap. This is partly because I’m not use to being awake at 5am, in any time zone, and partly because a day of talking wears me out. We needed to drive 400km (250 miles) from Eastern Austria to Western Austria to change customers. Before falling asleep, I remember thinking the lightly snow-dusted landscape reminded me of growing up in Indiana. When I woke up to a snow covered landscape set against mountains, it reminded me of Colorado. My escape from snow (and cold) is inevitable, even if I cannot see when it will occur. Maybe I’ll take another nap.